At this afternoon’s meeting of the Conservative Agenda, Political Insiders were asking Beloved Whistleblower Publisher Charles Foster Kane for the latest update on Russia Investigation the Destroy Trump Media has been talking about for the last year. France gave the Statue of Liberty to the USA and it’s REVERED, but Russia also gave a marvelous monument to the USA for the most admirable of reasons, yet it is mostly IGNORED. Notice how there was next to ZERO media coverage of this? Would you believe there are elements in the U.S. government and media that WANT to be at war (hot or cold) with Russia? In fact the monument was a gift – an expression of grief – from the people of Russia to the US and officially named ‘To the struggle against world terrorism’. Vladimir Putin was there when construction began and Bill Clinton attended the dedication ceremony in 2006. Since then, it has been forgotten. 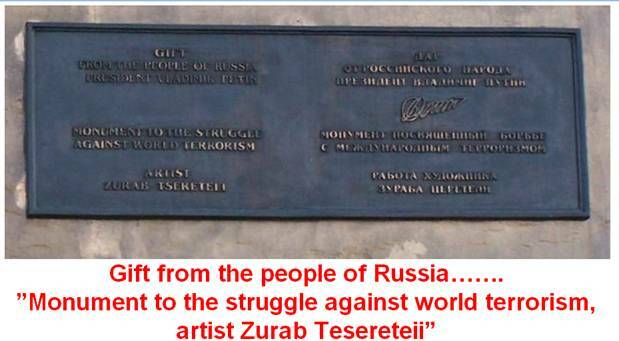 The Blower did some research and discovered its designer, Zurab Tsereteli – one of Russia’s leading sculptors – went to Ground Zero after the attack. He was told boats and ferries had shuttled survivors across to New Jersey, where many of the victims had lived. 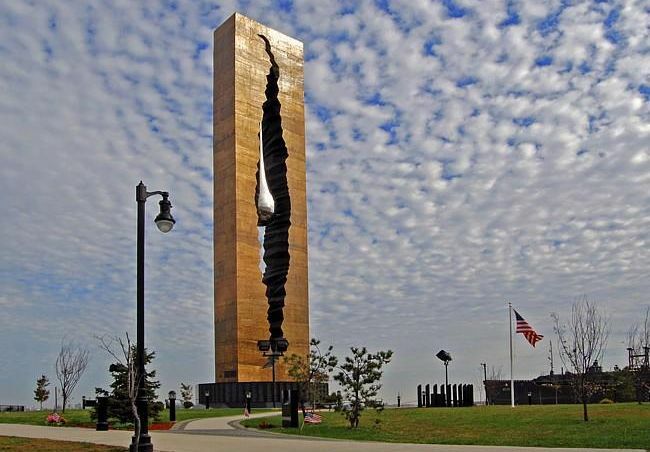 About 50 million people visit New York every year and more than eight million live there but no one seems to have heard of ‘The Teardrop’…which is odd because it is a 100 ft. tall, 175-ton memorial to those who died on the city’s blackest day. Learning of its existence by chance, we tried to discover more from locals at Ground Zero, where the Twin Towers of the World Trade Center stood until September 11, 2001, and was met with blank expressions. Our search began at the World Trade Center station, where a train took us to Exchange Place in New Jersey. From then on, instructions were vague – we had to catch a light-railway tram for eight stops along the Jersey shoreline to 34th Street in Bayonne and ask around. Eventually someone walked by and kindly offered to call a local taxi firm on his mobile. He’d never heard of ‘The Teardrop’, but luckily the taxi driver had. He drove us two miles across a wasteland which was once an army base until we came to an isolated quay. And there, high on a mound, stood the monument – a massive bronze-clad block with a great gash down the middle into which is suspended a 40ft, four-ton shiny nickel teardrop. ‘Nobody ever comes here,’ said the taxi driver. Indeed, we were the only visitors. In the far distance were the skyscrapers of Manhattan. 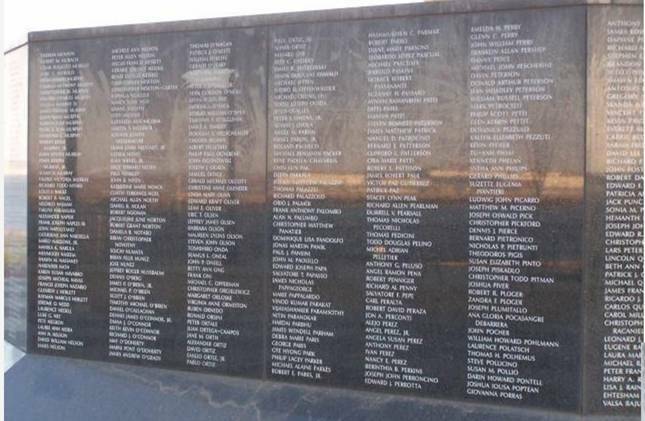 Around the base of ‘The Teardrop’ are the names of all those who died on 9/11 – including 26 Russians. 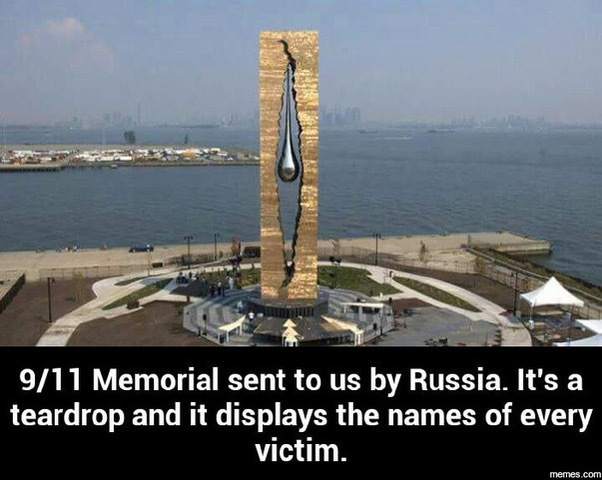 This entry was posted in Uncategorized and tagged 'The Teardrop', Bill Clinton attended the dedication ceremony in 2006, names of all those who died on 9/11, Russia’s 9/11 Memorial, To the struggle against world terrorism, Zurab Tsereteli on January 28, 2019 by charlesfosterkane.